Sometimes you get a hankering for a banana, so you buy some. And since you can’t eat very much banana in one sitting (if you’re on THM), sometimes you end up with a couple of bananas that go bad before you eat them. At least that’s how it happens in our house. So this morning we had 2 very speckled bananas-and I’m the type that eats them before they’re ripe, not after. So, with a ripe opportunity (see what I did there?) presenting itself, I concocted something with those 2 bananas. And this recipe makes 18 muffins. Do you ever get tired of recipes that just make barely enough food for one sitting? Using a hand-held mixer, mix all ingredients together in a mixing bowl. How easy is that. Pour into 18 greased muffin tins. You could try substituting more ground oats for the oat fiber if you do not have the latter, but I have not tested the recipe with this substitution and cannot vouch for the results. The muffins are a little gooey inside, like most banana products are. I'm guessing that one could bake this recipe in one or two mini bread pans and have banana bread, but I haven't tried that yet. The tops of these muffins really sink. I've noticed this trend when baking with oat flour. It doesn't bother me any, but it does create a handy little well to stick stuff in. 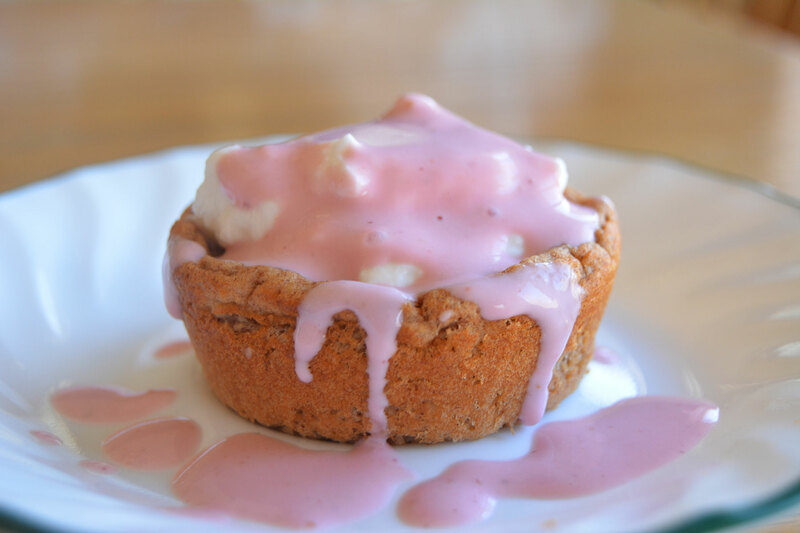 2 or 3 of these muffins with Greek yogurt would make a great breakfast! Oh I should say to that recipe I added a fourth a cup of gentle sweet Xylitol free instead of putting butter I added avocado oil…but could that make the difference? Hi I just made a batch of the dozen and a half muffins this morning and they looked great went in the oven baking great and about the last 5 minutes they went flat and I mean flat and they won’t bake through in the center I’m wondering what happened and so disappointed such a waste of ingredients! ? What do you think happened? I made these today and they’re great!! I was concerned my bananas weren’t ripe enough bc they didn’t have many brown spots yet but I added 2 medium droppers of Stevia and I like them a lot!!! I blended the wet ingredients together then poured into a bowl and whisked in the dry (I didn’t think my blender could hold it all and I don’t have a stick blender). I also added 1/2 cup dark chocolate chips (I know this adds a little fat, be careful thm people!). I made 21 bc I was afraid to overfill the pan. They didn’t sink in the middle which was a pleasant surprise!! They are still a little moist in the middle but totally hit the spot for this pregnant thm!! Hi, these look ymuuy, but do you have a recipe for just oatmeal muffins? I have a couple over-ripe bananas sitting on my counter right now, and I really would like to make this recipe before they go totally bad…..but we don’t have any applesauce at all. Is there anything I could sub, like more yogurt?